Union bosses have warned strike action by bus drivers “is not far away”, as ballots are posted out over a pay dispute. Unite claims First Aberdeen workers have been finishing shifts in tears, while others have been signed off with stress because of the looming changes to their contracts. It is feared that some could lose up to £6,000 a year from their pay packets, with alterations including being given fewer working hours and less holiday entitlement. The bus operator says the revised conditions are necessary in the current financial climate. Last month Unite asked its members if they would be willing to take the deal. Of the 260 balloted, just four responded favourably. 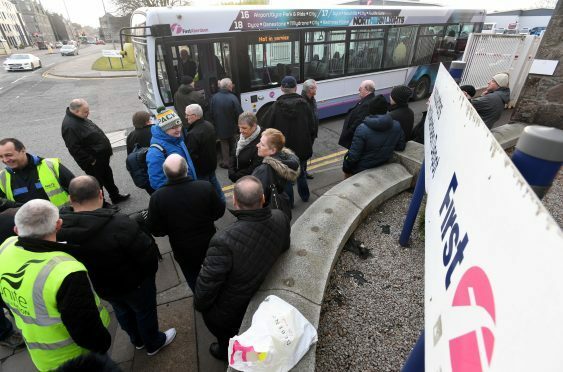 Talks between the trade union and the bus operator have since reached a stalemate, prompting Unite to distribute ballots over strike action this morning. The result is expected on February 28. Mike Flinn, from the union, said: “First are cutting into drivers’ wages to achieve more profit. He added: “Drivers who are earning £25,000 are going to jump down as low as £19,000. “They have rent and mortgages to pay and this cuts into it. David Phillips, First Aberdeen operations director, said: “It is hugely disappointing that union representatives have decided to ballot for industrial action. “The trade union must realise that we are operating in a very challenging economic climate, which has had a negative impact on the business. “During the period of consultation with the union and individual drivers, my door has remained open and this will continue to be the case going forward until the process is exhausted.